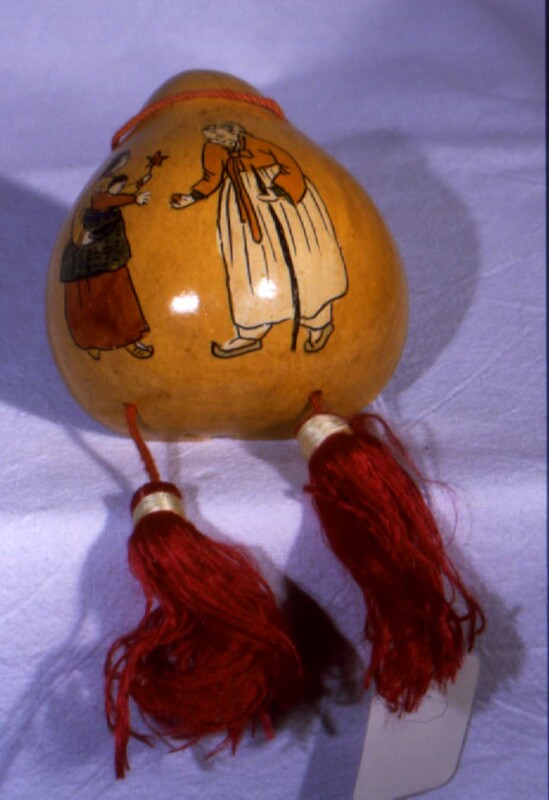 HALF SHELL OF DRIED LACQUERED AND PAINTED GOURD WITH TASSLES half gourd shell with clear lacquer and painted figures on front. figure on left is a mother with child. in her hand is a red star on a stick which she is offering to an old grey haired woman with a cane. Mother and child have black hair. all figures have cream colored faces and hands. mother wears a yellow vest or CHOKORI with orange collar and cuffs. wears orange skirt or TCHIMA. child is carried in green and blue CHUH NAY POH TAY KI. child dressed in orange. older woman on right wearing light orange CHOKORI and cream colored TCHIMA. her shoes are green. a red string is threaded though two holes on either side of the gourd's top and behind the front and back into two holes in the base. on each end of this string is a fuscia tassle bound at the top in pale yellow.